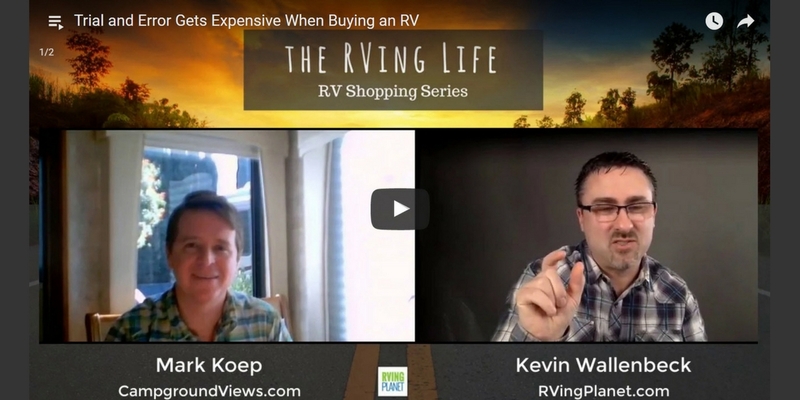 Welcome to the first episode of “The RVing Life Chats”, where I interview Mark Koep of CampgroundViews.com and learn his perspective on choosing the right RV for your lifestyle and the challenges along the way. Why trial and error will cost you thousands of dollars. Kevin: Today on the show we’ve got Mark Koep, he’s the founder and CEO of CampgroundViews.com where he’s focusing his efforts on making your camping trips amazing. As a virtual entrepreneur he and his family has spent the last eight years traveling in a motor home, and he’s basically building a tool that helps you discover what makes this country awesome. And we will get to more about his tool here at the end of the show today. But he’s an expert in communicating the RV lifestyle and takes every chance possible to plan your perfect RV adventure. He’s been a guest speaker on many, many places like the Outdoor Hospitality Expo, he’s been on Fox and NBC affiliates. And Mark is the go-to expert and answer the question guy on what is so great about RVing. So welcome to the show, Mark. How are you today? Mark: Good. Thank you for having me, Kevin. Kevin: Yeah, fantastic. So I see you got some sunshine there behind you, so where are you guys camping out today? Mark: We find ourselves in Southern California route in the city of Santa Paula which is a rural Ventura County, kind of in a farm country, so surrounded by strawberries and oranges. It’s absolutely beautiful. Kevin: Nice. That’s fantastic, so I know that for all you listeners out there and those are watching today, Mark’s basically going to share a bit today about his RV shopping experience as it relates to kind of the lifestyle choices that he’s making as he was shopping for his RV. So I mean at the end of the time together we’re actually going to have some tools to help you on your own RV buyers journey. So hang on till the end and make sure to get access to those free resources. So Mark, we’re going to jump right into what our listeners want, so just how long have you been an RVer, how did you get into RVing, and then what’s your current RV? Mark: Yeah, we’re probably a little different. So it started, we’re young, my wife was 25, I was 30 and we got to talk and said, “Well, what would we do if we have all the money in the world?” And we said, “Well, it was easy. We travel.” I said, “Okay, well, we don’t have all the money in the world. Can we do that?” And we said, “Well, yeah, we can.” I had a virtual business at a time, my specialty is internet marketing, web design. So it took us a year of planning, really kind of setting … putting our ducks in a row and we hit the road. We bought a fifth wheel and started traveling. And our original plan was to do it for a year, year and a half. And the second we got out and into the RV lifestyle it was for us. And so we’re going to be coming up on eight years here in two months and we have a son now who’s 4 years old. And we’ve just been loving the RV lifestyle. So for us it’s a bit different than a lot of other people but that full time RV lifestyle allows you to engage in areas and communities that you normally wouldn’t even stop at if you’re on vacation. You know if you have a two week vacation, you’re motoring to Yellowstone, Yosemite, Grand Canyon, the big destinations and you miss all these little places in between. And so that’s what we’ve enjoyed is just being able to engage in a community that we would never … we would have passed by on the interstate. And so that’s something that we found that’s amazing. And so for us the way we shop was the type of unit was important. And so obviously the bigger the better is our mantra because if you’re living in it it’s your home and when it’s raining for a week straight like it has been a California, we had this really strong winter. You’re stuck inside, and so for us space was important. So we have a very large RV, it’s a fifth wheel. And we’ve always had the fifth wheels because we don’t have to tow a vehicle behind it, we use the truck as our vehicle to drive around. And it’s just a consideration, some people are actually downsizing as full time RVers. So the whole discussion about what type of RV really fits into what your goals are and what your lifestyle is. Kevin: Yeah, so I think in the intro I mentioned motor home and so obviously I was wrong on that, but for some reason I thought that. But I know it’s fantastic. So why did you, if you don’t mind me asking, a lot of the questions that come through at RVingPlanet.com are questions related to the type of RV that you choose. You’re specifically a full time RVer, so there’s lots of folks out there that are thinking about doing this even if it’s not full time but maybe long term, right? So they’re thinking about three months at a shot or six months at a shot, why would you choose … why for you guys, why was it a fifth wheel versus a motor home? Mark: So before I answer that question I’ll back up the advice I give to everybody, if you’re even considering buying an RV is rent one first. Start with a rental. Don’t even go into the shop and start looking at models. Rent it. Now you can go to Cruise American rent a class C, or even they have some smaller class A’s, you can go online Craigslist, and there’s some rental RV sites where you can rent trailers. Rent them. Take them out on the trip and get … It will answer a lot of the questions of what you need. And we didn’t do that and we wish we had, because we learned a lot via trial and error. And so that’s my tip, rent one first. So then to us why we chose a fifth wheel, trailers are … So an RV to a trailer it becomes price, so to get a comparable RV to what we have in a trailer we will be in the 5 to $600,000 range for amenity, size, space and all that type of stuff. And the trailer were in we bought … it was three months old, the family that bought it didn’t want it. We bought it for $40,000 cash. And that gives you an idea of price points. And that was because we’re shopping around; we knew what the deal was. The second we saw it, we jumped on it. So when we first got in it was 2009 which was after the Great Recession, so the market was completely depressed. We bought a three year old diesel, a dodge diesel truck, fully loaded for $19,000. Kevin: Whoa, that is awesome. Mark: It’s worth more now after it’s kind of got some miles on it. It’s worth more now than when we bought it for, and the same thing with the trailer. We ran into an individual who just had to dump it and we got the trailer. So we originally budgeted $80,000 for truck and trailer when we first started. We spent 40 for both. Kevin: You’re kidding me. Under that. That is so sweet. Mark: The first 5th wheel was a Keystone Challenger and it was … which is basically on Montana, so it is a rebranded Montana. And it was nice. It served our purposes well which is my wife and I, and we travel for five years in that unit and turned around when we refold it we sold it for a $40,000 profit over what we bought it four or five years ago. The point being that if you kind of are aware of what you’re looking at, you can shop around, you can really do quite well and enjoy the lifestyle without breaking the bank. Mark: So from a decision point, rent. Rent one and get out on the road and try it out and see what the lifestyle is like. And then start deciding what’s your budget, what’s your goals, the advantages of an RV are you can pull up, hit a button, drop your jacks and you’re setup. With a fifth wheel you have to get out, unhook, drop the landing legs, a lot of bending down, a lot of setup. We don’t travel every other day or every day, so it’s fine. But if you do with a trailer it’s a hassle to hook up and do all that stuff, so there’s those considerations. Kevin: Yeah, I know on the sharing side I know there’s some sites like outdoorsy.co I believe and also RVshare.com and we’ll make sure to put those in the show notes below, as well as you mentioned Craigslist and Cruise America and some other ones. Mark: And there’s even … there’s a company here in California called RV Plus You and they take a little bit of the question out. They actually will deliver the RV to a site for you, set it all up and then you can experience that. So you don’t even have to tow it if you’re worried about towing. It can give you the living in an RV for a bit experience too. Kevin: Yeah, that’s fantastic. I know the first RV that we purchased, I know there’s a whole story embedded in RVing Planet, in different places, man, but first, yeah, our first one, man, was a total fail. And I thought I knew what I was doing. And I trusted everything that everybody told me, the people that I talk to, friends and of course everyone has their opinions and not everybody got it correctly. It’s just crazy. So I’m very grateful for you coming on the show today and just sharing these things. These are things that people need to hear. Mark: Well, you know what? I was thinking about it this morning before the show and I think part of it is, is that every … in general everybody grows up and lives in a house or an apartment or a condo, a stationary. Not a lot of people grow up and live in RV’s, they see all their money and they’re all of a sudden … they’re pretty well, they know what a house is, what to expect. But in RV they’re shopping completely blind and they’re taking these assumptions from a home into an RV, like, “Oh, I need marble flooring.” Without asking, “Well, how much does marble flooring weigh? And is it going to crack when it goes down …” Those type of questions. Houses and RV’s are different. There’s that old saying you’re basically subjecting your RV to an earthquake every time you drive it down the road. It’s true. And if you got hardwood, hard marble and stuff like that there’s going to be grout cracking and issues. So it’s something to be aware of. Kevin: Now you mentioned that one of the things that we see on some of the reviews that come across on RV’s from RVing Planet, and it’s no secret if you go look at the customer satisfaction index in the RV industry is actually a lot lower than people would like. And I think that that’s … I’m firmly a believer in the fact that it’s a product of having a house on wheels like you just mentioned. So can you speak a little bit about kind of maybe expected cost, maintenance costs and kind of that idea when you go to buy maybe not thinking about it as it’s a set it and forget it, right? I’m just going to buy it and it’s going to work for me forever, I’m never going to have any issues or concerns. I mean, you’ve been living in one, so how has it been for you, like maintenance wise, ongoing costs? Mark: Yeah, and that’s a really good question. So there’s two parts to it, you either have to be a little bit handy and able to handle stuff or you have to have a nice nest egg available to pay somebody to do it. And the paying somebody to do it actually becomes a big issue if you have to take it into a service lot like an RV dealership to have it service, you can’t drive in there today and have it repaired later on today, now. It’s going to take, they have to find a part, find an item and hopefully they have the part in stock, usually they don’t, they have to order it, get it, install it. So you’re going to have that delay. Alternatives too is you utilize a mobile repair service. That works in big areas like Arizona in the winter time, Florida in the winter time. It’s seasonal as defining mobile RV repair tech. But you’re paying somebody to do the work and the labor is not cheap at all. So I’m relatively handy and our experience we bought that Keystone Challenger, it was used. I did not know anything about tired and our first trip out, a 150 miles into the journey I had a trucker pull up next to me and he’s waving at us, and I’m like, “Wow, this guy’s great. He likes the trip. How’s it going?” And my wife and I are like, “It’s really nice. They must really like trailer.” And he kind of like just … whatever … and kept going. And ten miles down the road I look in the mirror and I just see smoke. Mark: We had a flat and it was going and it blew out, and it ripped part of the metal off the side of the trailer. And so at that point I realized I need to know everything about this unit. And so if you own a home, stuff breaks, your appliances break, stuff does break. Homes do not, you know, you always have issues, you always have repairs. And so the same thing happens with an RV especially if you’re living in it or using a lot. Stuff’s going to break. Now the real question is how do you deal with it? Do you fix it or do you take it in and expect a warranty to fix it or whatever. And all of the warranties aren’t going to cover wear and tear. So stuff’s going to break on the RV. It’s just, it’s inevitable. You’re living in it, you’re using it, you’re driving it down the road, you’re angling it around trees all that stuff. So in our case with this unit we bought we’ve actually been incredibly lucky. The worst experience we had is when we bought it they had a residential toilet installed on it. Kevin: Like this full unit. Kevin: It’s coming from the top down, right, yeah, yeah. Kevin: The water’s coming from the top down, right, out of the toilet and yeah. Mark: Yeah, it’s raining and it’s just constantly draining because you got water pressure and it’s constantly draining and it filled up the restroom. And luckily this unit we’re in was built well and it actually had a secondary overflow draining, you drain down on the ground. But nonetheless I woke up to that. And so that day, I mean, this gives you an example of pettiness. That day that toilet was out and I had a RV toilet back in. And that took me about an hour and a half’s worth of work. Nothing too complex but if you’re not able to address that you can imagine, I would have taken into a dealer, explain why there’s a residential toilet in it, we don’t cover it under warranty, yeah, no kidding, just put in a new one. All that conversation that I’d have to go to, whereas in an hour and a half I had the problem solved, everything was good. So there’s just little stuff like that that happens. And so I would recommend if you’re not handing getting to know a good RV repair technicians, there are some services online that you can subscribe to that where you can actually ask people questions, “Hey, this is broken. How do I fix it?” Your big items, your big worries are going to be plumbing as you mentioned, usually plumbing is the first thing because with so many fittings and such, just one fitting off and if you don’t have a pressure regulator, you plug into 110 PSI, that fitting leaks and you’ve got water in there. Kevin: If somebody’s thinking right now, “Pressure regulator, what are you talking about?” Right? And I’ve seen a lot of camp grounds now that will have them right on the spigot for you. Mark: That’s actually not even a pressure regulator. That’s a backflow preventer. It’s usually by code. So the idea is if your system blows black water, whatever back down the line it won’t go into the water system. Kevin: Okay, so I still need to put my pressure regulator on there. Mark: Yeah, we actually … I have a hardwired like a household style, the big regulator you would see on a household. I hardwired that into the unit because that works better and then I can just plug in the hose and we’re good to go. But it’s definitely something you need to consider. Water pressure, and then electrical surge. You need a surge protector on your unit. Well, you don’t need it, but it’s a good idea, it protects your electronics. Mark: And we’re scaring everybody too. Kevin: Yeah, I know, it’s like, “Whoa, what’s going on? Wait a second. I don’t want an RV. This is crazy.” But let’s flip that back around though for a moment, like when you go out and buy, you’re looking for an RV, right? And so your first one you bought used, what about your second one, same thing? Kevin: Okay, used. So you obviously probably take a little more care and choosing that. Obviously the first when you get a great deal on, I’m handy, I could take care of it, right? But when you go out and looking for one that’s used especially, there’s not that fresh from the factory expectation, right? So you went through that process of buying it, for yourself what’s the kind of the joy … what was the biggest success or joy that you got out of your experience of buying? Like when you wrote the check and you drove it away, like there’s probably a challenge there too, I’ll ask you that second. But what was the biggest joy of just that experience that you were proud of like yeah I did that right? Mark: Yeah, in the good points. So I’ll actually refer to the second RV, because that’s true we were educated buyers at that point. So we had been shopping for about six months looking for units, and we were actually looking for a toy hauler, because we thought we’d turn the rear entry into a bedroom. And this unit we have … it’s not a toy hauler, it’s longer than the toy hauler. In the back eight, nine feet is a whole separate bedroom with our closet and bunk beds for our son. Kevin: Yes. Like a bunk room or a bunk house kind of idea, yeah. Mark: Exactly. And so it was basically our other trailer with a bedroom on the back. And so when we drove away buying that, it wasn’t even driving like buying it. It was the second we walked up to that unit we knew that this is it. This is it, this is the one. And so at that point it’s just a matter of not showing how excited we are so we can try to negotiate some sort of reasonable price on it. You don’t want to go in there super happy. Kevin: So you had mentioned though that this was your second RV, so you’re kind of an educated shopper. But secondly the thing that I picked up on what you said and we hear this a lot is people think that they’re going to go … okay, so this idea of, we have this thing called the RV Buyers Journey. And there’s six different steps on here. I know you’ve seen this. And this is one of the resources that we’ll have available to everyone at the end. And it just goes through all these different things that people go through in RV Buyers Journey. And people tend to think of it as a car buying experience. Well, car buying experience there’s actually, there’s five, they’re very similar to this but there’s five. And the one that’s missed is number one is do I want an RV. Kevin: Right, people don’t think of do I want a car. They want what type of car because they need one to get to work. But they never ask themselves do I need a car. Kevin: So that idea in the buyers journey of do I want an RV, a lot of people will take, it’s simply not a 30-day thing, typically it’s not. If you’re buying an RV the first time inexperience and you buy it in 30 days there’s a pretty good chance you’re buying the wrong one. Kevin: Yeah, and you took six months as an experienced buyer to find one that was right for you, right? Kevin: I mean, that says a lot. We hear that all the time, so taking the amount of time necessary as a shopper, can you speak to that at all, like what? Mark: Absolutely, yeah. And it goes to the suggestion of renting one first. I don’t want to go to like the horror stories, but we’ve run into couples on the road where all day long the gentleman spends the entire day outside, and after a few days I wonder what’s something wrong here. So I went over and spoke to the guy. It turns out he and the wife retired. They bought this big beautiful are being hit the road, after three months they turned out they hated each other and can’t be around each other. So it’s that question of is an RV for us, can we live within less than 400 square feet together, does an RV experience provide the type of life that you want? Are you outdoors or you’re not? And you don’t need to be outdoors, you could stay in your casinos or in cities. The reality of this lifestyle is that in the United States we have 15,000 different places to camp mapped. There’s about 20,000 if you add in Walmarts and places like that where it’s not really a campground, but you can camp there. Mark: BLM, exactly. Like we have the main BLM’s but there’s other places. BLM are free areas that are run by the Federal Government that you can camp out free to free or low-cost. And so the reality is you can find a camping experience or an RV experience that fits your needs. But if you don’t know what your needs are, it’s the same thing with buying an RV, if you don’t know what you want you’re going to go in there and you’re going to be swayed by the wind, the price, the color, the graphics on the side rather than what do I actually need and what do we actually looking for. Kevin: No, I get what you’re saying though, right? Mark: So if you ask that question and that’s … I love the buyers journey, in fact my father’s in the process of … he retires in a year. Mark: And when you think about it, I’m in the industry; I’ve been here for eight years. But you know how it is with family. I don’t listen to my family. They didn’t know what they’re talking about. So it’s kind of like I’m trying to help guide them through this process when he’s not wanting to listen to me which is difficult. And so the first question and I’m still on that question is why do you want an RV? What do you want to do? Because he’s jumping from a trailer to an RV to tow behind to a truck, I mean, he keeps bouncing back and forth and it’s like what do you want, and I suggest you rent. It’s the same suggestion I gave everybody, rent. And even if it’s for like a week or two, just rent and get out and experience it. And then when you also ask yourself … when you experience it another mistake a lot of people do is they go to the most expensive destinations, they eat out every night, okay, which is fine. But when you’re done with that trip add up those costs that you just accrued during that, because that makes sense. Could you have rented a beautiful AirBnb on a beach for less? And so there’s those questions you need to ask. Lifestyle, who are you? What do you want? And what do you actually going to enjoy? Kevin: Yeah, how often you’re going to actually use the thing. Kevin: People like me, do you like being cramped, yeah, it’s just, there’s so many. So give me one challenge. What was your primary challenge when you and your wife are looking to buy, it doesn’t matter which are the first or second, we have all types of buyers here that come through RVing Planet. So what was the biggest challenge for you as you were shopping that you wish would be different, whether it’s an industry thing, whether it’s the experience of the discovery process? What was it for you? What’s the biggest channel? Mark: Our biggest challenge is actually the challenge you guys address over at Planet RVing which was, and you mentioned it already was finding the right unit, not the unit that was on the dealer’s lot. And so when we first bought, this is back in 2009, we drove to a total of six different dealers within a 500 mile radius. And we would walk into these units and it was just like, it wasn’t right. And you just, it wasn’t right. And these weren’t important. They weren’t for us. I’m not saying they we’re wrong for anybody else. They just weren’t right for us. Mark: And so that whole shopping process was, it was really the hassle, and that’s why there’s so many RV shows, and that’s something the industry is aware of is that the buying process is difficult for the buyers. So that’s why they bring the units out to malls and events and RV shows and it’s to get you out there and actually get you to go into the units and sit down on them and kick the tires and really kind of look and think about that process. So you’re going to an RV show, cruising your website is awesome. It’s just being able … and I wasn’t paid for this promotion. I’m being honest here. Being able to search by inventory and search by features that you want and kind of getting an idea of that. Some big considerations that you’d want to look at are length. If you want to stay at national parks and forest service, generally you want to be under 35 feet. If you’re over 35 feet it significantly limits your access. Do you want to stay in large RV parks and RV resorts? Well, then the sizes limit, although if you go too big it means you have to get the premier site which is going to cost you an extra five, ten bucks a night and all those things. If you want to boon dock a lot which is camping without any hookups, doing solar and stuff like, does the unit have space for solar on the roof? Does it have large holding tanks for waste and fresh water? Does it have extra batteries and potentially generator on board? So the type of camping you envision doing also dictates that. And so being able to … again it goes back to identifying how you want to camp, how you want to live and your RV. And that might be for a week, are you going to use the unit one week out of a year, you’re taking the ATV’s out on the beach, out on the desert or whatever. How do you envision using this and then utilizing that knowledge, then shop for the proper RV. Kevin: Now that’s awesome. Mark, we’re going to have to have you back on here soon, man, because I know we have other guests coming down the road. But obviously you’ve been doing this a long time and obviously you’re passionate about it. You’re living it every day, right? Kevin: And we could pick one of the 40 things that we just talked about, right, and spend a half an hour just talking about that thing. So this was, I really appreciate you being on our first RVing Life show, the RV shopping series. And so I’m going to give you the last word kind of here. So what final advice do you have for someone looking to purchase an RV? And then give us a quick update on what you’re doing now and how people maybe can get a hold of you? Mark: That’d be great, yeah. If you’re buying an RV it goes back to figuring out what you want. And what you want and it goes back to where you want to stay. So you’re buying an RV because you’re taking it somewhere. So that’s something, and that goes into what we’ve worked on. So what we discovered when we first traveled is it’s really hard to find places to camp especially when you’re going to a place you don’t know, what does it look like, how big are the sites, what are the neighbors look like, what is that area like? And so that’s what got us into building Campground Views. We have over 2700 parks filmed by campers. So you physically see what place looks like. We have another 21,000 photographs. And then recently over this last year we’ve acquired over 230 360 video tours of all the national park campgrounds, so you can physically, like a Google street view. You can physically go through and see the campgrounds. And so if you’re thinking about the RV lifestyle and where you’re going to go, we welcome you. Come to our site, check it out, and you kind of get an idea, “Okay, I really like this area or I like this type of park.” Then you can include that into your shopping and buying decisions and move on from there. And really the most important decision you’re going to make in the RVing lifestyle is what you RV in. It really, it dictates everything else after that. So doing your homework up front and realizing that you’re about to put down a small mortgage or a large mortgage, money on the RV to get out on the road, making sure it’s for you is a great way to ensure you’re not wasting money. Kevin: Yeah, that’s awesome, Mark. Hey, you’re a blessing, man. I appreciate you so much. So everybody, that’s going to wrap it up for this show, so until next time, happy camping everyone. 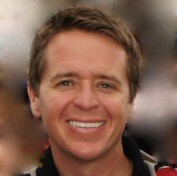 Mark Koep is the Founder and CEO of CampgroundViews.com focusing his efforts on making your camping trips amazing. As a virtual entrepreneur he and his family have spent the last 8 years travelling while at the same time building the tool that helps you discover what makes this country awesome. He is an expert in communicating the RV lifestyle and takes every chance possible to help you plan your perfect RV adventure. Mr. Koep has been a guest speaker at the California RV Show, Outdoor Hospitality Expo, and a number of online webinars and training sessions. His company’s video productions have been viewed by over 2M camping enthusiasts and featured on TV in segments by Fox and NBC affiliates. 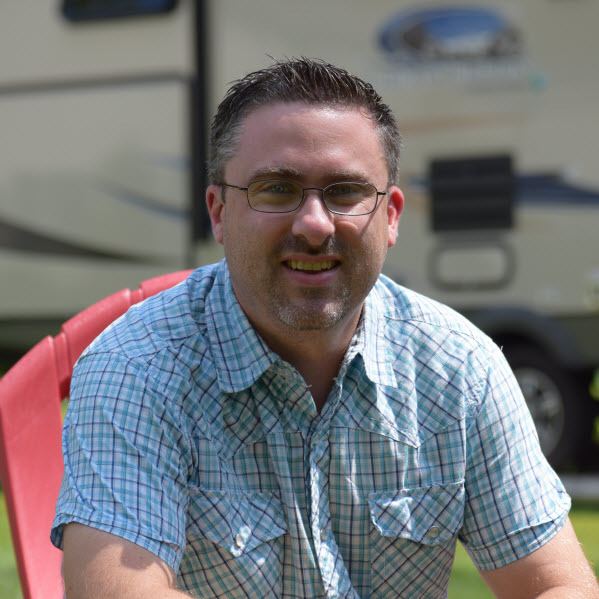 Mark Koep is the go to expert to answer the question “what is so great about RVing?”.